Guerlain Terracotta Sun Trio Bronzing and Contouring Palette Light is the first Guerlain bronzing and contouring powder that combines three shades in one palette, to tan, contour and light the complexion. In an instant, Guerlain Terracotta Sun Trio naturally reproduces the sun’s reflections on your face: your appearance is sunnier and the contours are sculpted with a matte, ultra-natural finish.For easy and sunny contouring:1. Warm up your complexion by applying the bronzing shade (the one at the bottom) by tracing a figure 3 on each side of the face.2. Create shaded areas by applying the darker shade (top right) under the cheekbones, to the sides of the forehead and along the sides of the nose.3. Light the complexion by applying the lightest shade (top left) to the temples, under the outer corner of the eye, and to the T-zone.For a tailor-made glow:Blend the colours however you like using a brush to create your own personal shade. 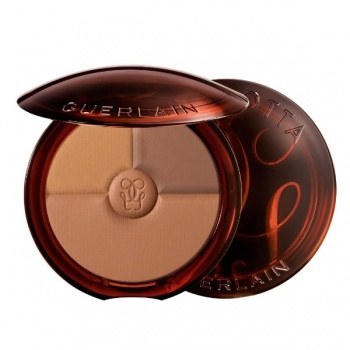 Guerlain Terracotta Bronzing Powder Mist 02 Medium has the effect of a makeup bronzer and the ease of a gentle spray. Gloss d’Enfer colours and shapes the smile for deceptively innocent, daringly glossy and deliciously provocative lips. Its fine, non-sticky texture glides over the lips like a veil.